The term outdoor living space refers to any form of outdoor space that helps bring the comforts of the indoors out. Winter is finally over. FINALLY! Spring has sprung and you know what that means: pool parties, barbeques, and…well, let’s not get ahead of ourselves. Before anyone starts planning their first warm-weather party, it is important to have the proper venue. You need a new Outdoor Living Space. The term outdoor living space refers to any form of outdoor space that helps bring the comforts of the indoors out, such as a screened porch, pergola, outdoor kitchen, deck, patio, gazebo, or pagoda. These spaces allow people to enjoy the great outdoors with a little extra protection from the elements. Just think about it. With a new pagoda, the occasional rainstorm won’t be able to ruin your barbeque. With a screened porch, mosquitos won’t stop you from enjoying those cool summer nights. With a…well, you get the idea. The right outdoor living space will also serve as the focal point of your landscape, greatly improving your home’s curb appeal. Just think about how good that new pergola would look in your back yard. Like any home improvement project, a new outdoor living space will add value to your home. Just how much value? Well, that all depends on the project. The right outdoor living space can also increase your privacy, an especially important benefit if you have nosy neighbors. 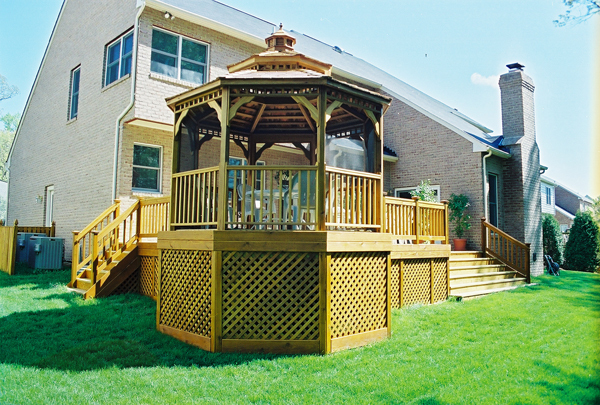 Established in 1987, Mid Atlantic Deck and Fence Co. is a family owned and operated deck and fence company in Maryland. More than 25 years later, we are one of Maryland’s leading and most innovative deck and fence companies and one of the only companies in the state that custom designs, builds and installs all of our own decks, fences, pergolas, pagodas, and gazebos. If you have any questions about choosing the right Outdoor Living Space, please contact Mid Atlantic Deck & Fence (MAD Fence) today by calling 1-800-833-9310. We offer a wide variety of outdoor living spaces and screened rooms, from screened porches, screened pagodas, and even screened gazebos. Mid Atlantic Deck & Fence proudly serves Anne Arundel, Baltimore, Howard, Montgomery and surrounding counties.